It has been almost two weeks since I attended the AYA Summit in Washington DC at Google’s offices with ONE, and I still feel a flood of emotion each time I think about the experience. As I wrote on my blog last week, the words to explain such a powerful and inspiring event are hard to come by. The AYA Summit focused on issues facing girls and women in the developing world, with a special emphasis on Sub-Saharan Africa. The name AYA comes from an African Adinkra Symbol, which means fern and symbolizes endurance, resourcefulness and growth. I, along with fellow World Moms Blog contributors Jennifer Burden, Elizabeth Atalay, Nicole Morgan, Nicole Melancon, Kelly Pugliano and Cindy Levin, sat in a room of about 80 bloggers and listened to inspiring panel after inspiring panel. In addition to thought-provoking conversations about human trafficking, the importance of vaccinations, electrifying Africa, making change through economic opportunities and the dire need to end Ebola in West Africa, we witnessed incredible performances by a young poet named Marquesha Babers and actress Danai Gurira. Tears were shed. We were all moved and left wanting to do more for women and girls around the globe. There was a general theme of storytelling throughout the event. As bloggers, we have the ability to tell the stories of girls and women around the globe that the mainstream media simply cannot duplicate. We use our experiences as women, mothers and global citizens to lend our voices to those who don’t have a microphone and help others join in the conversation. We personalize the stories, talk about our concerns, and amplify the issues that media may not even be fully aware of or willing to devote the time to cover. As Ginny Wolfe, Senior Director, Strategic Relationships at ONE, said at the very start of the AYA Summit, “We’re not asking for your money, we’re asking for your voice.” If you are reading this post, you can lend your voice too. 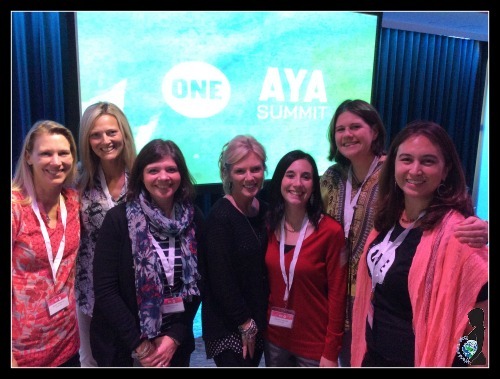 For more on the AYA Summit and the work that is coming from the event, visit and follow the AYA Summit 2014 Flipboard. This is an original post written for World Moms Blog by Jennifer Iacovelli who also writes at www.anotherjennifer.com. How will you or do you use your voice to stand up for those who are unable to speak up for themselves? Thank you so much, Janine. I appreciate your support! I’m still having a hard time pulling all my thoughts together for a post…it will come- just so much to share- and you did it so well! Thanks, Kelly. I could probably write at least 3 more posts on the summit. It was just so much to take in. I’m so glad we were able to be there. Looking forward to your post! Thank you for sharing. I cannot believe it has been two weeks already – I am still processing so much! I think I’m still processing too, Aimee. That’s the power of the summit. It gave us all so much to think about. Great post, Jennifer! Thank you for recapping the AYASummit. It was an incredible summit for the plight of women and girls. I will never forget hugging and sobbing while holding onto Saa, one of the girls from Chibok who got away within 24 after Boko Haram captured over 200 girls in Nigeria. Her story was so powerful. The Chibok girls need our voice! There were so many incredible story tellers and powerful topics. It meant a lot to be a part of it! And it was great to see you there, Jen. I’m so glad my former roommate from the Social Good Summit two years ago is now a part of World Moms Blog — welcome aboard! Thank you, Jen! It’s been great getting to know you. I’m so happy to be here. Saa was all I talked about when I got back from the summit. I’m not sure why I didn’t mention her in this post. Seeing her and hearing her speak is a whole post in and of itself. As always, I am inspired! I retweeted at least half of those – such powerful thoughts. People let it happen… so people should be able to stop it, right? Big hugs and thanks for being such a great voice and ambassador! Exactly, Alexa. Our voices have power. I know you understand the power of advocacy! Thanks for helping to spread the messages from the summit.